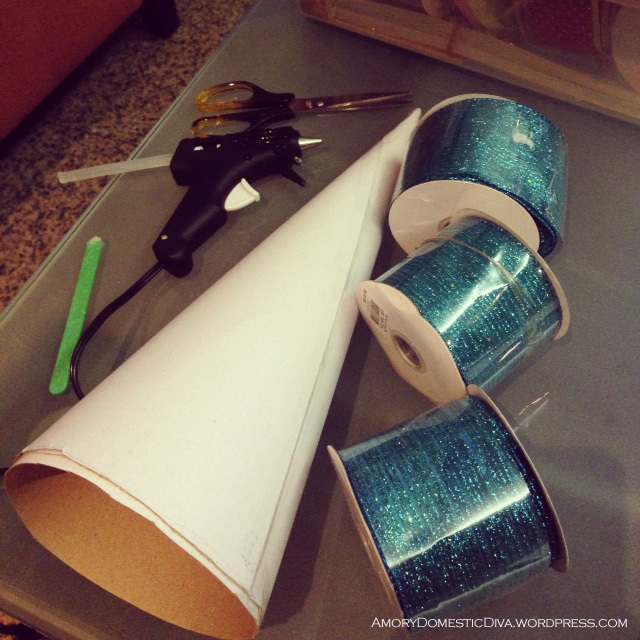 Naturally, a do-it-yourself (DIY) project is the most practical solution to this décor dilemma. It was so unlikely that I, who barely had good marks in my Practical Arts projects in school and I, who have never used a glue gun before, have finally decided to make my own table-top trees. Yes! After a few hot glue burns and glitters all over me, I was able to create something with my bare hands. I still can’t believe I did it, but there’s always hope for everybody! For those of you who are interested with this Christmas project, I’m sharing the procedure with you below. It just looks complicated but it’s really easy. Enjoy yourself and happy decorating! By the way, don’t forget to play your favorite Christmas tunes while making this this project. *TIP: There are ready-made styrofoam cones in some stores but I suggest that you just make your own out of poster cardboard to save yourself some bucks. 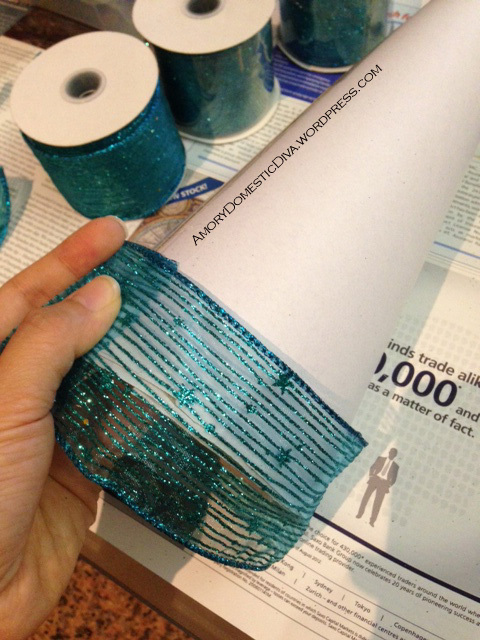 Measure out your ribbon to cover out the bottom part of your cone and glue it. Let an inch dangle out around it, cut some slits all the way to the edge of the cardboard and glue them back in the cone. 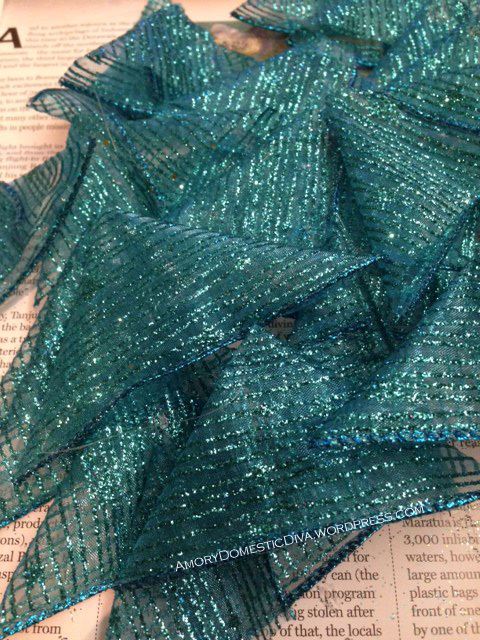 TIP: Cover your working table with a mantle cloth or newspaper to protect it from the falling glitters and melted glue later on. 2. Cut your ribbons into about 3.5 inch rectangular sheets. 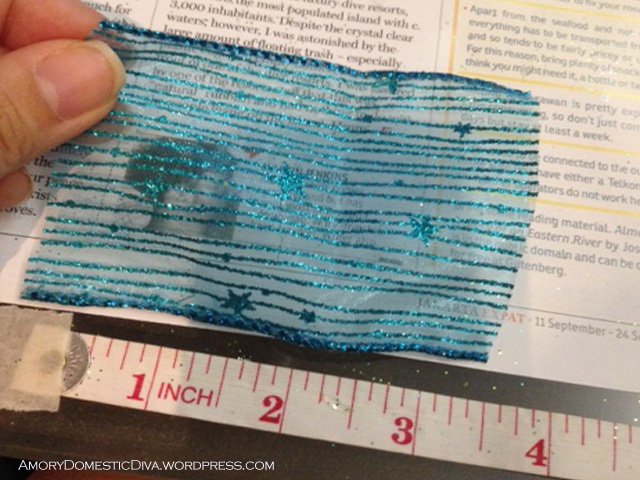 If you have wire on your ribbon, you may remove the wire for easy folding. 3. 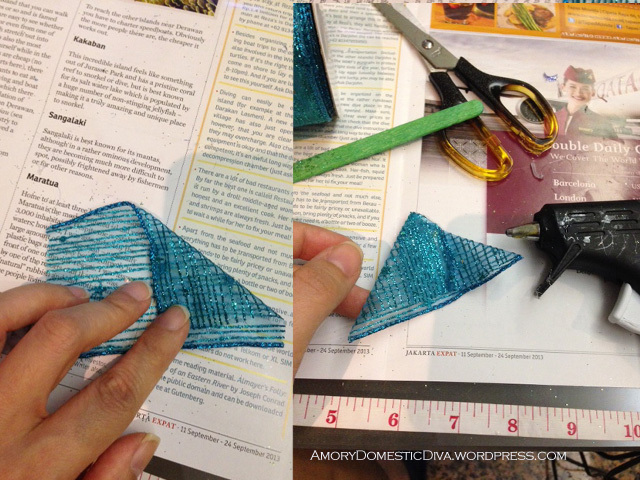 Make little triangles out of these rectangular sheets using the glue gun to secure them. This is where you’ll use the popsicle stick, don’t use your fingers to fold and press the glued ribbon because it would be too hot. The back part where the crease is may appear to be a little messy but don’t worry about it, the only visible part would be the front part. Make sure that the pointed part of the triangle is clean too. I can’t tell exactly how much you should make because it depends on the size of your cone. I suggest that you make about 2 dozens first and then just make another bunch when you run out. 4. 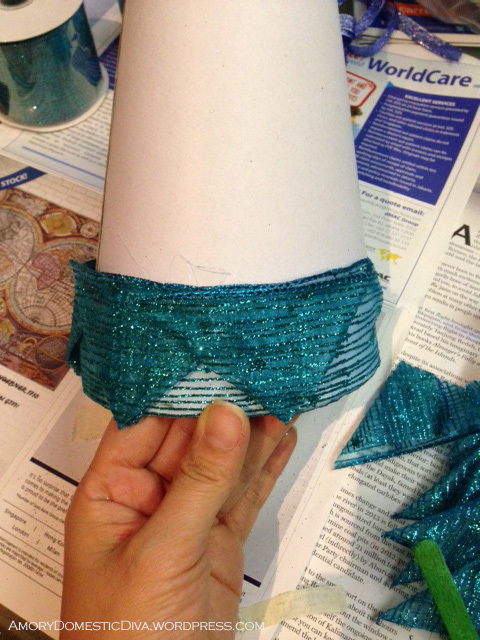 Stick you first triangle over the seam so you’ll cover it right away. Put glue on the bottom part of the triangle and stick it upside down such that the pointed tip is facing down. 5. Your next triangle should slightly overlap the one next to it. Make sure that the triangle tip ends at the edge of the cone. Continue doing this until you fully cover the bottom layer of your cone. 6. 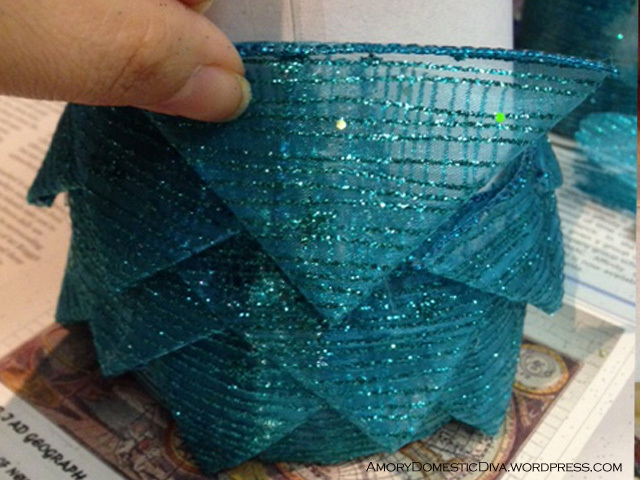 For your second layer, put your triangle in the middle of two bottom triangles and slightly higher. Repeat this process until you cover the entire cone. 7. For your finishing touches, take your favorite tree ornament to serve as your tree topper. 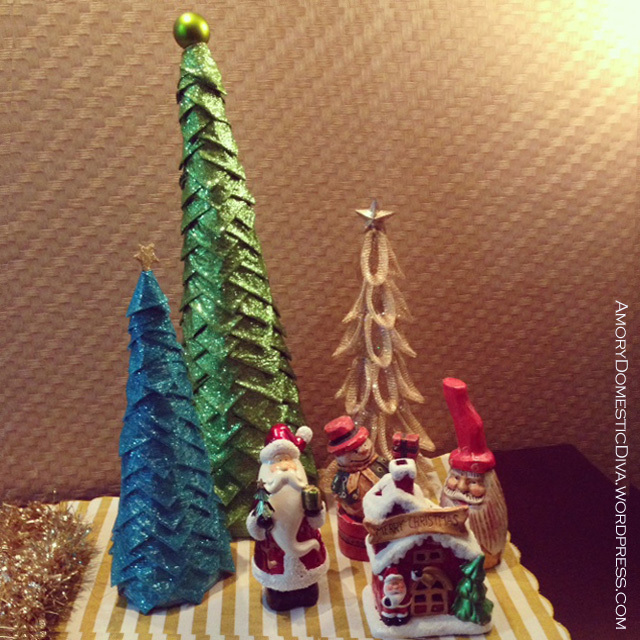 You may also opt to embellish your tree with little rhinestones or other ornaments, I just went for a simpler and cleaner look.